"Possession indeed is a major issue in this new work, Outer Pradesh (Anomalous Press, 2014; limited edition of 100 copies).Here Mackey applies the concept of “held-not-had” to relationships of love, and the concept of “I-Insofar” conveys the feeling both of the borderlessness of the body-moving-“outward” and of the tenuousness of identity." 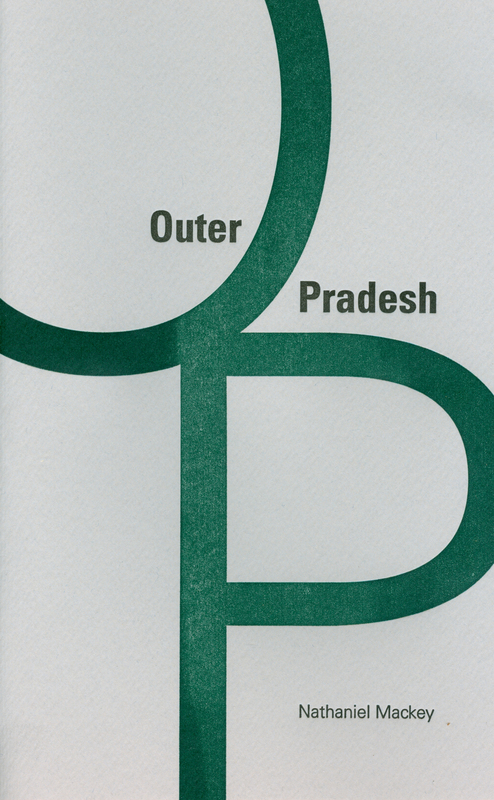 "Of Outer Pradesh the judges said: “The book’s epigraph is Jean Toomer’s assertion of modernist open-endedness and generic not-belonging: ‘There is no end to ‘out.’’ Mackey applies this endlessly outward-going passage to an ecstatic, exilic experience, as a group of travelers — a ‘philosophical posse’ — makes its way across an Indian province. What they and we encounter on this journey is a pre-history embodied by ‘old-time people’ whose songs must be heard. Together we find ourselves within an improvised social continuum that grows larger, stranger, more remote, and more consoling at every turn. Memory becomes a site of social commentary and collective vision. Mackey’s epic of fugitivity forms a stunning meditation on being.”"
Nathaniel Mackey is the author of five books of poetry, most recently Nod House (New Directions, 2011), an ongoing prose work, From a Broken Bottle Traces of Perfume Still Emanate, of which four volumes have been published, most recently Bass Cathedral (New Directions, 2008), and two books of criticism, most recently Paracritical Hinge: Essays, Talks, Notes, Interviews (Wisconsin, 2005). He edits the journal Hambone and coedited, with Art Lange, the anthology Moment's Notice: Jazz in Poetry and Prose (Coffee House, 1993). He lives in Durham, North Carolina, and teaches at Duke University.